We’ve all been there – plowing away at a term paper, vigorously scrolling away at social media or quickly spiraling down a black hole of viral videos when suddenly, our device dies. Nothing kills the mood more than a dead battery. That is why it has become absolutely essential to carry a portable charger around. As technology improves, more of our classes have become reliant on internet or laptop usage. 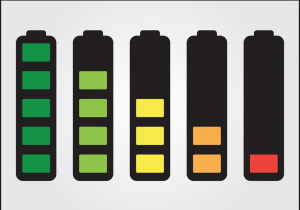 Having a full battery has quickly become not just an essential for personal tech use, but for getting good grades as well! Carrying a portable charger around with you will quickly become essential to passing all of your classes. Personally, I prefer to study anywhere outside of my bedroom. From College Library to The Terrace, a change of scenery can prove to be incredibly helpful to creating a conducive studying environment. One downside, however, is that there can be a lack of outlets. Especially on busy days, finding a good spot with a close outlet is a scarce resource. By having a portable charger on hand, you can study virtually anywhere without having to worry about your battery life! Even if you remember to charge your devices, that doesn’t guarantee that your study parter will. I find studying to be more enjoyable in a group setting, but it won’t work if everyone’s battery dies! Your portable charger won’t only help you to maintain a long battery life, it can help a buddy of yours too. It’s not just a nice thing to do too, it will keep your study buddies around you for longer as well!